Satellite tagging is becoming fascinating in some animals, none more so than the endangered bluefin tuna. With many adult fish being tagged since 1999, a group of 132 juvenile tuna fish were tagged and implanted, then followed for four years. Benjamin Galuardi and Molly Lutcavage of the University of Massachusetts began the tagging in the Gulf of Maine in 2005. They publish their results in PLoS ONE. The northwest Atlantic is hazardous for both adult and juvenile tuna, so if we know their dispersal routes, their horizontal and vertical movements and their habitat choices, a lot more can be done for their conservation. ICCAT are responsible for this, in collaboration with government agencies. While fisheries produce figures and other sources have provided data, this is an important first, providing an independent profiling resource. In the summer, it was found the young tuna stayed within the area between Maryland and Cape Cod (Massachusetts), remaining at a mean of 5-12m depth on the continental shelf. In the winter they spread out, ranging to the South Atlantic Bight and the northern Bahamas, now deeper at 41-58m. Because so few tags were recovered, some measurements, such as habitat use were not significant enough to report. A high survival rate, however, was similar to adult results and suggests hardiness. The smallest fish fed on Ammodytes sp. (the sandlance) on the Virginian seabed, while the larger juveniles spread their horizontal range and fed more generally. According to fisheries, 50% of the catch in the NW Atlantic is Mediterranean in origin. 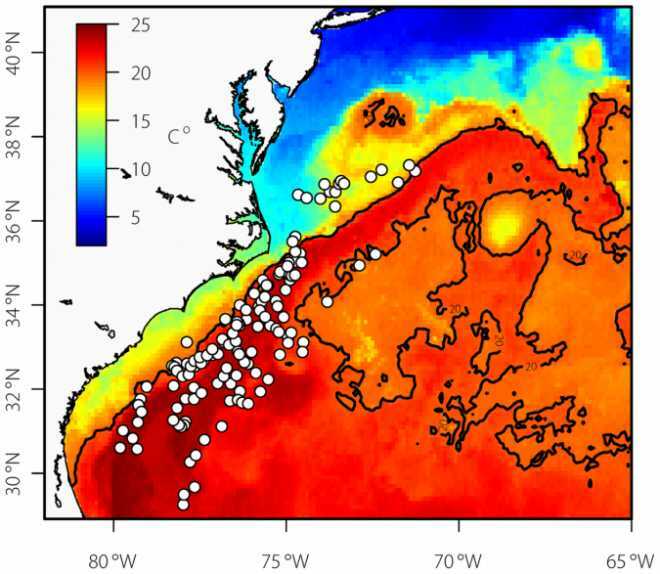 This seems untrue for these juveniles as they winter in the protection of the Gulf Stream, as seen on the map. Obviously they do not return the visit of any European cousins. However the authors believe they can locate these Mediterranean fish with further US tagging, or with tagging within the Mediterranean juvenile shoals.